Although February is Black History Month, I hope that you will not confine your reading about the African-American experience to only 1/12 of the year. 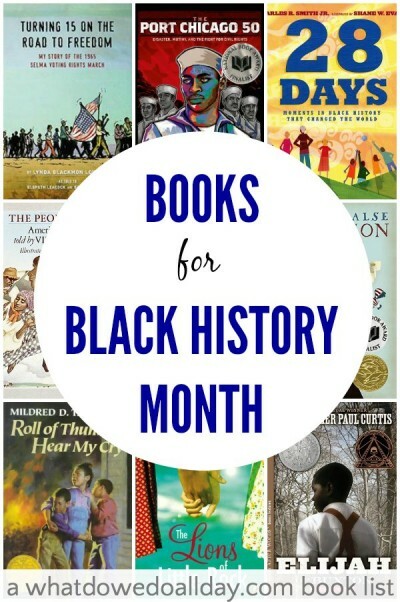 I’ve created a list of superb chapter books for Black History Month. Most of the books are for kids ages 10 and up, but I also included an acclaimed anthology of African-American folktales that can be read aloud to younger children. In addition, 28 Days can also be read to younger children. I would assert that these books are not just for kids, but adults will gain perspective from them as well. Reading about experiences from a child’s point of view often can open our eyes to exactly how the policies and attitudes of adults can effect people’s lives, both positively and negatively. If you subscribe to my newsletter, you will recognize this book from my “On the Hold Shelf” feature. (If you don’t subscribe, you can do so here!) Turning 15 on the Road to Freedom: My Story of the Selma Voting Rights March is an appealing conversation-style first person narrative by Lynda Blackmon Lowery, the youngest person to march all the way from Selma to Montgomery. Lowery describes her experience being jailed nine times (all before the age of 15) and beaten on Bloody Sunday in Selma, Alabama. It’s an amazing story and I actually was unaware of how huge a role teenagers played in the events leading up to the Voting Rights March. This is marketed as a YA book, but I think it is appropriate for ages 11 and up. It’s not very long, the text is not dense and there are some great photographs included. Lowery speaks directly to children and tells them they have a voice and can be history makers just like you. A final reference to the 2013 Supreme Court decision and assertion that discrimination no longer exists challenges the reader, “Who has the right to vote is still being decided today.” An superb, must-read book. 28 Days: Moments in Black History that Changed the World is not technically a chapter book, I suppose. For each day in February, the book introduces readers to a different African-American who made an impact. 3 Supreme Court decisions and a constitutional amendment are also included. Although the format of the book does not support in-depth biographies, the book is chock full of interesting and important information and is a terrific introduction. Everyone will want to go out and learn more. I appreciated how the entries varied in style, from poems to prose. The Port Chicago 50: Disaster, Mutiny, and the Fight for Civil Rights is about a little known event in 1944 in which war and civil rights collided. 244 African-American soldiers refused to follow a command which they felt would have put them at unnecessary risk. For their stand, they were charged with mutiny. Sheinkin’s book looks at the event, what led up to the mutiny and how differently the armed services treated its white and black soldiers. Fascinating. The People Could Fly: American Black Folktales. While most of these books are for middle grade readers, the stories in this book can be enjoyed by kids as young as 5. Celebrated children’s author Virginia Hamilton put together this wonderful collection of Black American Folktales. There are several categories of tales ranging from animal trickster tales, tales of the supernatural and slave tales of freedom. At the end of each short story, Hamilton includes her notes on the origin of the tale and its dialect. Roll of Thunder, Hear My Cry is a book I remember from my childhood. It is the first book I remember reading that opened my eyes to the harsh realities of racism and I am forever grateful to it. (I grew up in a mostly white community.) 9 year old Cassie narrates her experience living in Depression-era Mississippi as her family struggles to maintain ownership of their land. Cassie undergoes her own awaking to the brutalities of prejudice and the importance of a strong community. I just finished reading The Lions of Little Rock, set during the 1958 Little Rock school closures. Marlee makes friends with Liz, the new girl, but when Liz suddenly leaves school Marlee discovers Liz was “passing.” The two continue the friendship in secret while Marlee joins a group that works to reopen the schools. There’s a lot to like about this book. Marlee faces the typical social challenges of being 13 but also sees the ugliness of institutionalized racism and how frightening and dangerous it can be. Several others go through transformations of opinion, but nothing seems forced. Elijah of Buxton. I almost added The Watsons Go to Birmingham–1963 to this list because I do love it so (I’ve put it on four lists so far, most recently chapter books about diverse and loving families, so please read it!) but instead decided it’s best if I introduce you to a different Curtis book. In the 1860s Elijah becomes the first free child born to runaway slaves in a colony in Canada. His family sees him as “fragile”, crying too easily or getting scared or hurt. The first part of the book is filled with humorous antics surrounding the community of Buxton. Later, Elijah makes the decision to travel to America to help a friend recover money that was stolen from him and the nature of freedom stares him straight in the eye. Glory Be is another look at racism in the South. This time 11 year old Glory becomes active in the fight against segregation when the local swimming pool is “closed for repairs” when it is required to open its doors to the black population. As with most of the fiction books on this list, the focus is on the characters and how friendships with people different than themselves challenge their thinking. One Crazy Summer. It’s 1968 when 11 year old Delphine and her sisters travel from New York to Oakland to stay with the mother who abandoned them seven years earlier. Their mother, who is not exactly happy to host them, enrolls them in a day care run by the Black Panthers. Williams-Garcia’s writing is splendid, with interesting characters. It was a hard-to-put-down kind of book and an great non-preachy story to show kids how politics infuses daily regular life. Chains. (series) A compelling trilogy of slavery in the North, whereas books about slavery are most often set in the South. During the American Revolution a 13 year old slave belonging to a ruthless Loyalist family, Isabel, yearns for freedom. She meets Curzon who encourages her to spy for the Rebels. Forge is told from escaped slave Curzon’s point of view. I LOVED both Chains & Forge! They have such great voice & heart. I’ve been dying for the 3rd installment, Ashes. When I went to a book-signing for Forge several years ago she mentioned that Ashes would alternate between Isabel’s and Curzon’s points of view. I have been waiting for this for so long, but I’m not sure when it will be released. I also liked Lions, Glory Be & One Crazy Summer. And of course, Brown Girl Dreaming and anything else by Jacqueline Woodson. I like Locomotion, Hush and Feathers.